Gezza has been doing some middle of the night coverage. US PRESIDENT TRUMP HAS ACCEPTED RESIGNATION OF UN AMBASSADOR NIKKI HALEY. TRUMP SAYS SHE WILL LEAVE HER POST AT THE END OF THE YEAR. A lot of head-scratching about why she has resigned at this time, just before the mid-term elections. Reasons unclear. Trump’s apparently told her he hopes she returns to the administration & can have pretty much any job she likes. Doesn’t seem to be a disagreement with Trump ? Showing Nikki speaking to press, sitting with Trump, in those yellow chairs now. Doesn’t have any set plans. Reviewed all the US has achieved,including getting NATO pay more various other things Trump has pursued like Iran, making the US respected again – if not liked by everybody at least respected & is satisfied. Going out on a high. She told the president earlier in the year maybe two years would be long enuf. Not leaving until the end of the year, plenty of time to hand over to next UN Ambassador. Thanks Mr President, it’s been an honour. No she’s not running for 2020. She’s campaigning for 2020 supporting the president. Haley’s & Trump’s press conference. Interesting comments from Aljaz UN political editor. Word around the UN is that she is politically ambitious, very politically astute, gone along with Trump because his pro-Israel and other political positions match hers. Very well placed to run in the future as a Republican candidate for first woman President, should she choose to do so and should Trump not be in the running. That last comment may be the key – ” should Trump not be in the running”. It could be a long political game by Haley. “Now the U.S. is respected. Countries may not like what we do, but they respect what we do,” she said, citing a number of achievements of the Trump administration. “The U.S. is strong again, it’s strong in a way that should make all Americans very proud,” she told reporters. On why it’s time to leave, Haley said she’s a believer in term limits and believes it’s good to rotate new government officials in from time to time. There may be a hidden reason, but sometimes people in high profile, demanding jobs just want to have a break from it. The U.S. ambassador to the United Nations, Nikki Haley, is resigning “to take a little time off,” President Trump said, as she became the latest in a long line of high-profile departures from the administration. So interest will now turn to who Trump replaces her with at the UN. Was she signalling a role for Jared Kushner? Theresa May’s leadership in Britian is said to be on very shaky ground, aas is their Brexit plans, after Brexit Secretary David Davis resigned from the government. 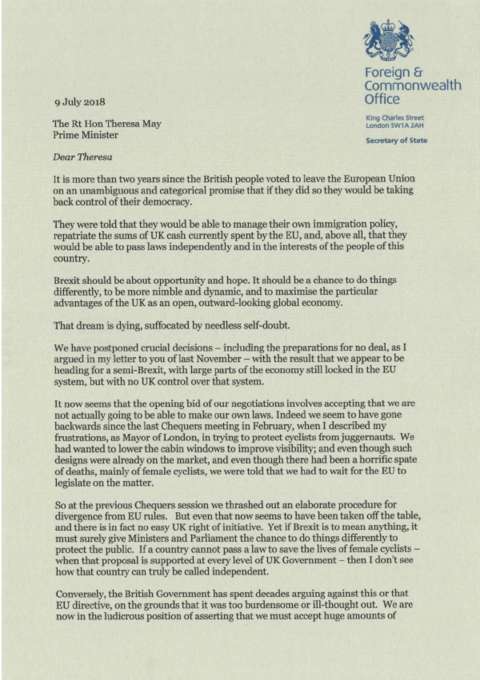 In his resignation letter, Mr Davis criticised the PM’s Brexit plan – agreed by the cabinet on Friday – saying it would leave Parliament with “at best a weak negotiating position”. In his letter, Mr Davis told Mrs May that “the current trend of policy and tactics” was making it “look less and less likely” that the UK would leave the customs union and single market. He said he was “unpersuaded” that the government’s negotiating approach “will not just lead to further demands for concessions” from Brussels. Junior minister Steve Baker quit shortly after Mr Davis – as Mrs May prepares to face MPs and peers later. The Conservatives have struggled since May took over as Prime Minister and led them into a disastrous snap election. And it looks worse now. 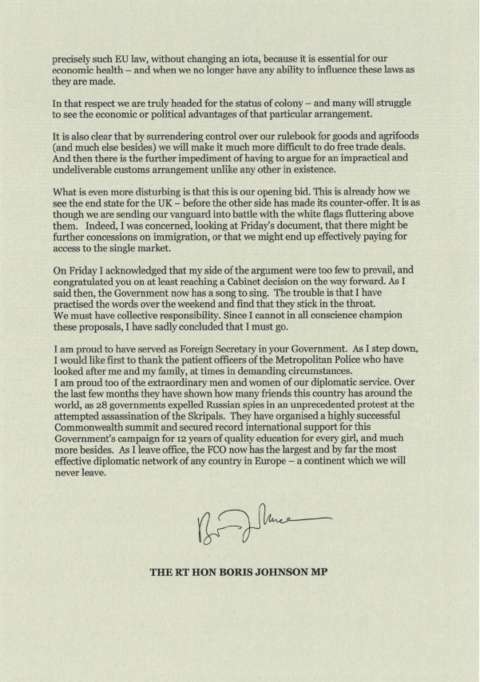 Mr Johnson said “we appear to be heading for a semi-Brexit” and had concluded he “must go” since he “cannot in all conscience champion” the proposals agreed by Cabinet on Friday. Mugabe is out: After 37 years in power Robert Mugabe has resigned. Read our full report. Zimbabwe celebrates: People are out on the streets of Harare waving flags, holding signs, dancing, singing and celebrating the end of an era. How it happened: The announcement came as Parliament began proceedings to impeach Mugabe, six days after the military seized control in the capital city. The Speaker of the house read a resignation letter from Mugabe prompting applause and cheers from lawmakers. What we don’t know: The whereabouts of Robert Mugabe and his wife, Grace are unclear. As Internet MANA members move into decision mode I have shared my own intentions today. I will step down from Party leadership in December. I personally favour a network, rather than electoral party option. However, I intend to take a guiding (rather than leading) role in this process so that members have plenty of chance to generate options and decide between them. I want to acknowledge all the member and supporter engagement that has come through this page since May 29 – I am not leaving the frontline, just the post. So I’ll keep sharing here (if Facebook lets me stop being a politician!). Next time around I’d like to think we can do better than just a political jigsaw. To that end I am stepping away from the electoral focus for now to pay more attention to the “why” of the “Why we need change” question. A hint she could be separating further but not clearly. Are you still here as leader of the Internet Party? Yes, I am here as leader of the Internet Party, and at the moment I’m guiding the party through a review of the future. I’ve also made a personal decision that once that review is completed, I will step down from the leadership of the Internet party. Again just stepping down from “the leadership of the Internet Party”. But she also said she would love to be in Parliament. Look, I would love to be in parliament. I would love to be articulating the kind of fundamental agenda and values that Internet-Mana promoted in the election campaign, and I’m not prepared to say never again to being personally at the front line. Officially resigned as @InternetPartyNZ Leader and as a member today. Onwards! So she is right out of the party. Today I have officially stepped down as Leader of the Internet Party. I have also resigned my membership. This year many of us saw the opportunity to connect some newcomers to progressive party politics (in the form of the Internet Party) to a kaupapa Maori movement with a solid base in working class and poor communities – MANA. I have already shared my analysis of the election result on this page and elsewhere. I first joined a political party 32 years ago and have always promoted participation in parliamentary politics. For major progressive gains to be made our parliamentary parties need to be rooted in real constituencies and supportive non-party institutions which build wide support for our values and ideas. That’s what I will keep working on. I really enjoyed the interactions that I had through this year – online and on the road. I hope you will stay connected. Her next plan is a road trip around the North Island next February with her sister to engage with grass roots supporters. There’s plenty of time before the next election but her party options to help her get back into Parliament may be limited. Would she rejoin the Internet Party again in 2017 if they offer her enough money? Dotcom says he’s broke, and presumably he’ll be more broke if he starts an Internet Party to contest the US election in 2016. Harré may not be welcome at the Green Party after she deserted them and took their policies with her to the Internet Party. The Mana Party is an obvious option andn it may be the only one, if they survive and contest the next election. Another party could emerge but the chances of getting into Parliament for any new party are very slim. Harré’s resignation may have resigned her to being a non-parliamentary political activist. David Shearer resigned today, after going on gardening leave yesterday – or more accurately, he visitied Seddon. He may have felt more at home in a natural disaster zone than a caucus made one. It’s sad to see this, but it was inevitable. Almost certainly the revelation of the secret meeting with Key over the GCSB bill was the tipping point, the fact that it happeend and seems to have been kept from colleagues, and the way Shearer blundered the revalation, giving John Key a free shot in question time on Tuesday. See Shearer-Key secret meeting stuns mullets. But there is also hope. Perhaps FINALLY Labour will realise the have to work together and seriously begin rebuilding a party that has floundeed since Helen Clark’s exit in 2008. Ironically (or tellingly) Clark was reported to be visiting Wellington today. Labour have a difficult month or two finding a new leader, unless caucus quickly decides on an unchallenged successor. Then they have difficult fifteen months buillding into a credible alternative and at the same time showing significant signs of renewal.